We Indians love narendra modi make in India initiative and now a Indian company comes in the the market and want to compete with all other Chinese players in the smartphone market of india. Smartron you can say master blaster Sachin Tendulkar Company after they failed to cache eye with t.phone and t.book launched last year now they come with a budget smartphone. Because everyone know there is a lot of competition in this Budget Segment. But Smartron srt.phone is ready to beat any competitor out there like Oppo, Vivo, Lenovo, Moto & Xiaomi with amazing specification and stock android feel like pixel. So is this a phone which we are looking phone which is made in india and designed in india. 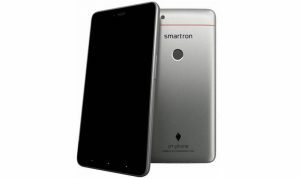 Smartron srt.phone is second smartphone by smartron which they launched in May 2017. T.book is the first phone of the company which is not very popular at that time. The srt.phone comes with an affordable Android smartphone priced at Rs. 11,999 for the 32GB variant. There is also a 64GB variant which is priced at Rs. 12,999. But good thing is that both versions come with 4GB of RAM. This Smartphone is exclusively available on Flipkart. The phone comes with a 5.5-inch touchscreen display with a resolution of 1920 X 1080 pixels with 401 pixels per inch. The Smartron srt.phone is powered by 1.44GHz Octa-core Qualcomm Snapdragon 652 processor. Which is really popular in budget segment. As i said above both versions comes with 4GB of RAM. The phone packs 32GB & 64GB of internal storage which cannot be expanded via micro SD card. This phone rocks a 13-megapixel main camera and a 5-megapixel Selfie camera. The Smartron srt.phone runs Android 7.1.1 out of the box which is the latest version of android without any extra bloatware almost stock android and company promise to provide security update regularly. srt.phone has a 3000mAh non removable battery. It measures 153.00 x 77.00 x 8.90 (height x width x thickness). The Smartron srt.phone is a dual SIM (GSM + GSM) smartphone that accepts Micro-SIM and Micro-SIM. Made & Designed in India By Indian Company. Almost Stock android which everyone loves. Design is not strong point of this phone. Camera is not the Best. First of all a big thumbs up to Master Blaster to making this possible and great phone at this price range with top-notch specifications. We 100% Recommend this Phone to anyone who is looking for a Indian Smartphone with latest Specifications and Stock android Experience.